Sodium is an element that the body needs to function properly to regulate blood pressure and blood volume. For individuals who are sodium-sensitive, an increased intake of sodium may contribute to high blood pressure. 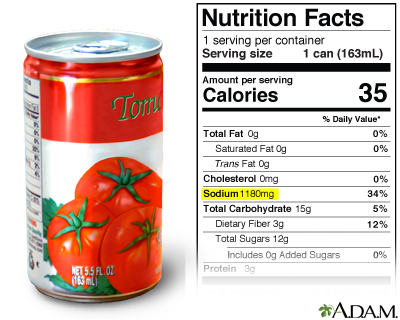 When watching the intake of sodium, read labels carefully to determine the total sodium content, be sure to note the serving size and number of servings per container. Canned, packaged, and frozen foods can be particularly high in sodium.